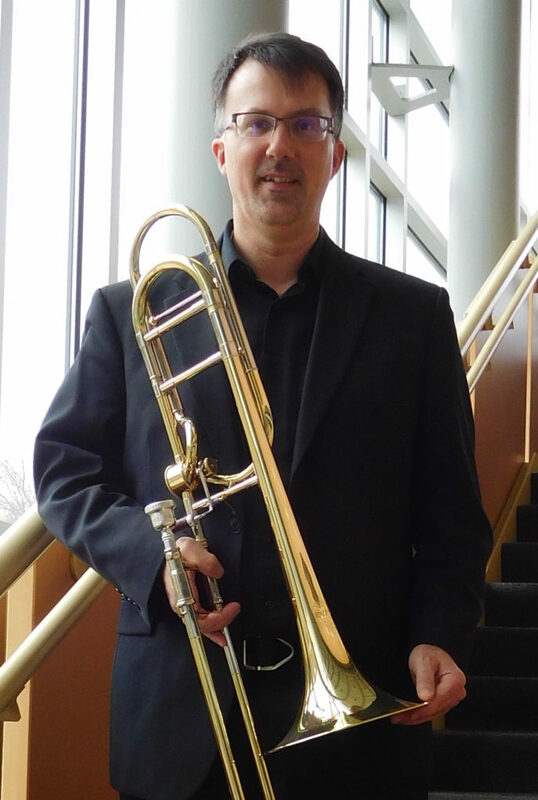 Dr. Mark Babbitt is currently Professor of Trombone at Illinois State University and Principal Trombone of the Peoria Symphony Orchestra. He is highly accomplished in all areas of performance and has nearly twenty years of university level teaching. His students are active and successful professionally all over the country in many aspects of the music world. For several years, Mark performed extensively with the Seattle Symphony Orchestra and Seattle Opera. He recorded 11 works with the Seattle Symphony ranging from the symphonies of William Schuman to orchestrations of Brahms piano music (as well as music of Mahler, Dvorak, Borodin, McKinley, and Bodine). With the Seattle Opera, Mark played productions of Verdi, Puccini, Mascagni, and Wagner (including the Ring Cycle and Flying Dutchman). He has performed with dozens of orchestras, many as guest principal trombone, including Oregon Symphony, Honolulu Symphony, Pacific Northwest Ballet, and Illinois Symphony Orchestra. Additionally, he has played with the Rochester Philharmonic, Chautauqua Symphony, Erie Philharmonic, Cincinnati Ballet, Northern Kentucky Symphony, and Wheeling Symphony. While living in the Pacific Northwest, Mark was active in the recording studios working on over a dozen movie soundtracks (The Incredible Hulk, Valkyrie, Punisher: War Zone, Stargate: Continuum, etc. ), movie trailers, video games, and countless other commercial projects. As a soloist, he has appeared with a number of professional orchestras including the Peoria Symphony Orchestra, Everett Symphony, and Chelan Bach Festival Orchestra. Additionally, Dr. Babbitt has been a guest soloist bands with several Universities and semi-professional groups: San Francisco Wind Ensemble, Seattle Wind Symphony, Brass Band Northwest, Millikin University, Lower Columbia College, Columbia Basin College, and Cascade Winds, as well as with dozens of high school groups throughout the country. He has twice served on the faculty at the International Trombone Festival (Ithaca, NY 2004 and Eastman 2015). For nine summers he taught at the Sewanee Summer Music Festival in Tennessee and two at the Marrowstone Festival in Washington. He has judged numerous solo competitions in several states as well as major national and international competitions (Walgreens National Concerto Competition and ITA George Roberts Competition). Prior to his appointment at Illinois State University, Dr. Babbitt was Associate Professor at Central Washington University (10 years) and served two years on the faculty at Xavier University (Cincinnati, OH). Mark earned degrees in trombone performance from the Eastman School of Music (BM, Performer’s Certificate, and Emory Remington Scholarship recipient), Cleveland Institute of Music (MM), and the University of Washington (DMA). His primary teachers include John Marcellus, Steve Witser, Don Immel, Hal Reynolds, David Vining, and Bob King; and additional studies with Tony Chipurn, Glenn Dodson, Greg Cox, and Mark Kellogg.